A similar incident is recorded by an early New Hampshire colonist named Richard Chamberlain. For three months in 1682 rocks tossed by unseen hands battered the New Hampshire home on New Castle Island of George and Alice Walton, and crashed through their small leaded glass windows. A torturing hail of stones followed them into the fields, pelting their arms and legs, bruising the flesh. George Walton, an elderly tavern keeper and planter was struck full in the back. When he crossed from New Castle Island to the Portsmouth mainland by boat to report what was happening to him, a flying rock "broke his head". The mysterious flying stones came and went all that summer. As many as 100 were reported in one session, always focused on Walton or anyone who happened to be near him. Walton reported being struck as many as 30 or 40 times. When he visited his son who lived up along Great Bay, the rocks flew at him in a field, but mostly they hammered at the Walton’s home. Some were hot, as if just taken from an oven, while some were cold as death. They ranged from tiny pebbles, to stones the size of a man’s fist, or as large as a human head. Chamberlain records many other frightening incidents of the devil's mischief both inside and outside the house. There are a few explanations for this incident suffered by poor George Walton, who was marked with injuries till the day he died. One is that Walton, a Quaker, had himself been accused of wizardry after he accused his neighbor Hannah Jones of being a witch. This was the result of a property dispute. According to Chamberlain, Hannah Jones angrily told Walton that he "should never quietly injoy that piece of Ground". Her comment was taken for a bewitching curse and, therefore, evidence that Jones’ witchery had likely summoned the Stone-Throwing Devil. Cotton Mather, a powerful Puritan man who served as a judge less than a decade later at the deadly Salem Witch Trials, wrote about this incident and saw it as a precursor to the hysteria of Salem. Another explanation however sees this as an elaborate "prank" by Puritans to drive the Quaker Walton's out of New Hampshire. The Walton's were a scandalous family to the Puritans on many accounts, and if a natural explanation were to be given, this would fit best. Yet it hardly explains every incident, especially those recorded in the house, and certain supernatural elements in the story. Somewhere in Chalkis, the relationship between a man and his wife had become very strained. The husband did not lead a normal life, but lived in a strange, obscure manner. His face took on a repulsive expression. He had broken away from the Church; he wanted nothing to do with Church life, and especially not with the Sacraments. His unfortunate wife tried in every possible way to bring him back to God, but he was unyielding. Finally she understood that she must take a hard position. "Listen to me. You have made my life unbearable. If you won't come to receive Communion on Pascha, I am going to have to leave you. It will be impossible for us to live together. I want Christ to rule in our family." The persistence, pressure, threats, and heartfelt prayers of this good Christian woman were not in vain. The husband saw that by his behavior he was in danger of irreparably destroying his home, his future, and the future of his children. His soul was shaken, and he resolved to return to the light. Great was the darkness hidden within him, for the unfortunate man had descended to collaborating with the demons; he had trained himself in magical arts. This is what had kept him so stubbornly away from the Church. He understood that he first of all needed a confessor. The Holy Mountain was not far away, and there he went, seeking the right person. He found Fr. Sabbas. How different was his return journey! He was renewed inside. Instead of confusion, chaos, and darkness, he saw a new regenerated world. Relief and tears of joy shone on his face as he finished his confession. What peace he felt, what a lightening of his burden! But there was still something else to get rid of. He stretched out his hand, holding a certain book. "Take this book also, my Father. This was the cause of my catastrophe." It was a Solomoniki (a book of magic), the essential manual of all who study magic. "Why are you giving it to me? It wants burning. Take it and burn it somewhere away from here." On his way from the Kalyve to St. Anne's Skete, he saw a large hole in the rock. In this cavity the Solomoniki was soon reduced to ashes. The Evangelist Luke wrote about a similar incident: "Those who followed magic arts made their books into a heap and burned them" (Acts 19:19). Fires like these are a joy to the angels, a wounding of demons. Such books of darkness and stench should not circulate among us. Still more relieved, the man continued on his way. He happened to meet Fr. Hilarion, a disciple of Fr. Sabbas. "Convey my respects and boundless gratitude to the father confessor. And tell him that the book was burned in the cave above here." Fr. Hilarion continued heedlessly towards the Kalyve. But when he reached the cave, showers of great boulders fell around him, thundering and rolling down the hillside. Terrified, he reached the Kalyve and told the Elder what had happened. "It was the work of Satan, my child." When he had recovered from his fear, he remembered to convey to the Elder the words of the man he had passed on the road. He remembered about the burning of the book. When Fr. Sabbas explained who the man was and what book he had burned in the cave, he understood what had happened. Not only Fr. Hilarion experienced the stoning, however - it happened to everyone that passed by that place. In the end the road became impassable, for nobody dared to come near that place. Disturbed, the fathers sought the help of Fr. Sabbas. He fasted, prayed, sprinkled the cave with holy water, and the evil spirits retreated. He advised the fathers to place an icon of the Theotokos and a lampada within the cave. Thus the road became peaceful as before. Today those who pass by there often stop and sing "Meet it is..." to the Theotokos, with no danger. Some fathers have told us, however, that occasionally there is still demonic activity in that place, mainly when a disciple who has broken obedience passes by it. A young pastry-cook from Thessalonika, Athanasius, felt aversion for worldly life, and resolved to take the monastic schema and live in the Holy Monastery of Dionysiou. As a novice at Dionysiou he was sent to Monoxilitis, a Metochion within Mount Athos, to receive monastic training. In the meantime, his parents in Thessalonika were embittered by the decision of their cherished only child. They moved heaven and earth to "save" him, to bring him back to the world. They did not even hesitate to seek the help of Satan, resorting to magic and sorcery. Athanasius suddenly began to feel pressure, as though there were a heavy weight on him. He himself in his former life had dealt in magic, and so was not uninitiated in such matters; therefore he correctly guessed what his parents were doing. He felt an anguish that became more and more intense. Something very unpleasant was hanging over him. From inner need he prayed more frequently, painfully emphasizing the phrase in the Lord's Prayer, "Deliver us from the evil one." The other brothers of Monoxilitis suspected nothing of this. One morning after the service as they were preparing for their work, stones suddenly began falling on them from the forest above. Luckily for them and for the property of the Metochion, they suffered no harm. They waited a while - some passers-by, apparently, had an appetite for jokes. 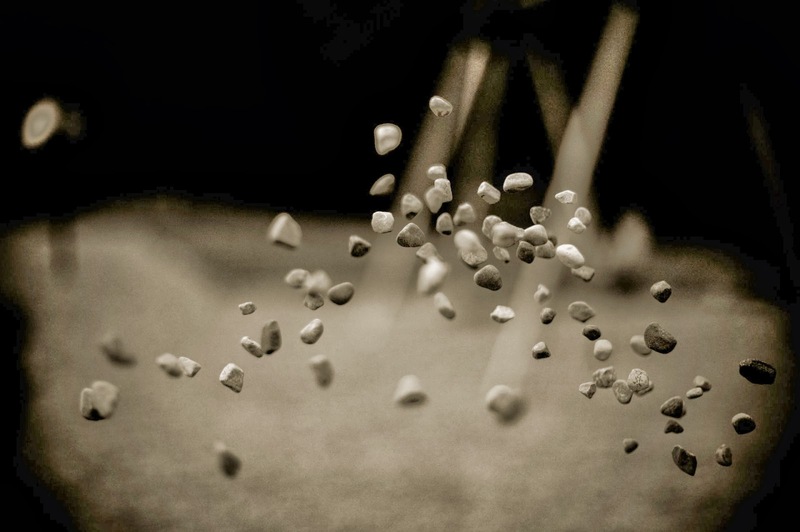 But when they began their work again, stones started flying from behind them. Then they understood that something serious was happening, and they took refuge in the church. They did not dare to leave it, for as soon as they did so the stoning would start again. Stools, wooden forms for the monastic skoufias, and other objects were hurled through the air. Their dog was thrown three meters down from where he had been lying. Soon some policemen who had been notified came from Karyes. They searched the area and shot volleys in the direction the stones came from. Finally they realized this was not the work of men, but of unseen enemies. Then the novice Athanasius came forward and explained the cause of the mischief. "To completely persuade you," he finished, "let me go by myself over there to the little church of St. Artemius, and you'll see that stones will follow me." This is what happened. The stones fell all around him, but without hitting him. After the demonstration they isolated him in the church. The steward of the Metochion, Fr. Porphyrius, sent a letter asking for a boat from the Monastery. From the moment Athanasius left the church until he disembarked at the harbor of the Monastery, terrible things happened. It is a wonder that the boatman did not faint from terror. "The stoning did not cease on the sea, even though they were a distance from the shore. The stones kept falling, but fortunately around the boat, without doing any damage" (Gabriel of Dionysiou, The New Evergetinos, p. 65). Between the shore and the courtyard of the Monastery, all was quiet. This encouraged several people to call it an illusion. A sudden shower of stones from a nearby tower, however, silenced them. The Council of Elders, which assembled immediately, made the decision "to send the novice to the God-bearing Elder, Fr. Sabbas ... so that he may deliver him." The general conviction of the fathers was that the prayers of Fr. Sabbas could flog the evil spirits. The Kalyve of the Resurrection underwent a week of hard trials. There was an atmosphere of war - an open war between the powers of light and darkness. There was continuous, deafening noise. Enormous boulders came loose from the nearby cliffs, flying by and over the Kalyve, and hurtling with terrible crashes down the nearby precipice into the sea. Fierce voices uttering blasphemous words disturbed and sullied the area. And there were insults - unwonted insults against all monks, and especially against the confessor. All the stench of Hades revealed itself. The man of God, disregarding his deep old age (he was then in his last years), gave himself up to great struggles. For a whole week he kept a complete fast, praying continually. "This kind goes not out but by prayer and fasting" (Matt. 17:20). His compassionate heart could not endure seeing God's creation undergoing such tyranny. At the end of the week, the Elder, with steadfast, unwavering faith in the Resurrected Lord, approached the sufferer. The evil spirit became agitated. "I banish thee, ... O unclean spirit ... by God Who created all things by His word, and by our Lord Jesus Christ ... Fear, begone, flee, depart from the servant of God Athanasius ... Depart to the dry, deserted, uncultivated places...."
"O Saint of God, you have saved me, you have taken away the horrible weight. Oh, thank you! You rescued me from the dreadful serpent. Glory be to Thee, my God!" Athanasius stayed with his physician for several more days. By his advice, he went to the Skete of Koutloumousiou, where he remained. Fr. Habbakuk - the name he received at his tonsure - is distinguished among the fathers by his austere ascetic life. He never forgot the unforgettable Elder who had saved him from the power of the devil. 2. John Sanidopoulos, The Rise of Bogomilism and Its Penetration into Constantinople, p. 56. 6. Archimandrite Cherubim, Contemporary Ascetics of Mount Athos (vol. 2), pp. 432-436.